Food delivery application is a notable and well-accepted trend of the mobile application era. That is one application whose services are highly revered and is for sure to be present in your handheld device. The current success factor of a food delivery application is enough to give app developers a proper working mechanism of the system. However, with current advancements in technology mobile applications and smartphones are evolving to a smarter side and any top mobile app development company would look to incorporate the best features and functionalities. As of 2019 revenue in the Online Food Delivery segment amounts to the US $95,413 M followed by an annual growth rate of 9.6%, resulting in a market volume of US $137,596 M by 2023. Above which the restaurant-to-consumer delivery alone has a market volume of US $74,451 M once again in 2019. Despite such heavy numbers Food Applications still await some great upgrades which can help take the experience to the next level. Nevertheless, food applications require a lot of improvements as the business conducted does have its own flaws. One of the biggest of them all is that they are not that restaurant friendly and more focussed on towards the satisfaction of the customers and less to service of the restaurant owners. In BrainMobi’s opinion, a Food Application should help escalate and ease the business of restaurants as well. With that reason, in particular, let us check out how food apps shall evolve and become a step smarter in terms of service and experience. It could seem really altruistic the fact that a food application is willing to leverage sales for a particular restaurant with the discounting package it complies to offer. Out of several food applications, the one with the most lucrative discounts eventually becomes the most popular one. This does benefit in adding more users to its list but more importantly how does it add to the audience growth of the restaurant. This remains a crucial question to ask. However, as long as food applications take the burden of discounting on their shoulders, no restaurant brand would hesitate to rely on its services. But it could be a total waste of effort and finance if that particular discounting strategy is not applied tp other customers which could other help increase audience reach for the RESTAURANT. More importantly, such a method of identified discounting procedure could help any impressionable restaurant to conduct a wider marketing campaign whose overall cost would be fairly affordable to the individual capabilities of a restaurant. This would eliminate any market rates that food applications charge on the strength of their personal brands. To successfully implement this all that a particular food application requires is proper monitoring methods which help evenly distribute a marketing-module-guise-under-discounts to the attention of the entire demographic. For its automated procedures, sophistication and brand reliability food applications are mostly a preference which in turn has enabled app owners to mark the frequent habits of its customers. Prolonged usage of this mechanism within the application can lead to the accumulation of valuable data which can help the system make out traits and routines of the user. This, in turn, can help the system to deliver accurate choices thereby minimizing the burden on the part of the customer. This way food apps of the new wave can help reduce decision fatigue and contribute towards a more proactive routine. This can be manifested in the form of accurate restaurant displays as per a particular cuisine choice which works best when in an alien city. UX as of this date was more about the combination of eyes and fingers. With the advent of voice recognition and virtual voice assistants mobile UX shall be more about ears and voices leaving your eyes and fingers free for other tasks thereby contributing towards more multitasking options. Food Applications can be clubbed with voice recognition units in handheld devices or smart watches which can help you conduct your food transactions while your eyes and fingers are hooked to some other work like driving your car or straightening your hair. Food apps as of yet were designed solely for your gourmet relations with food and as of yet seldom would you find applications dedicated to helping you follow a particular diet belonging to a particular regime. So while the apple smart watch series fancies a feature of making accurate measurements of your heartbeat and a properly arranged statistic of that data can help you figure out the standards you need to follow in regard to what you eat and what the market of restaurants serve. 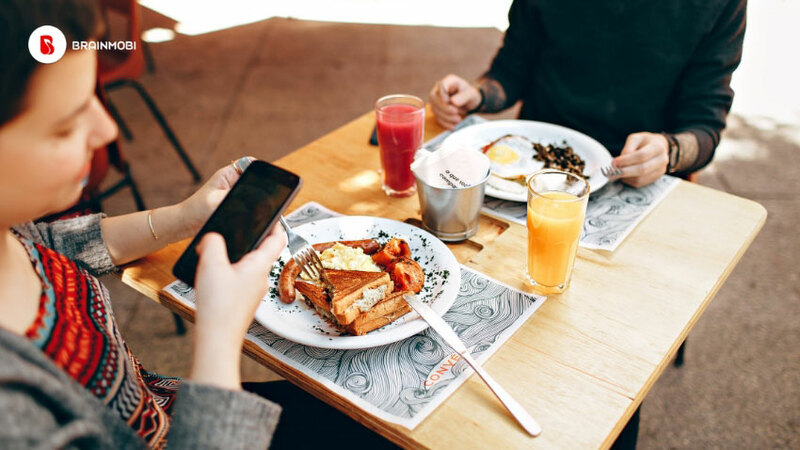 In combination with food applications, your daily calorie and nutrition intake can be measured and notifications in regard to your daily intake can be provided. In comparison to a nontechnical mode of food delivery and cuisine experience, a technical mode (like implementing a food mobile application) can help you scratch out customer behavior by recording and maintaining proper marketing analytics. This, in turn, will come to the benefit of the restaurant owner who can get a better picture of what their audience likes and they don't. This will accordingly help them in carving better services and help increase sales and service. As one of the top food app development company, we at BrainMobi conduct extensive research in regard to the kind of advancements that can be delivered in the field of food applications. Our long list of endeavors with food applications alongside several foreign clients have enabled us to get a good insight of how these things work and we aim to deliver the best in clients to those looking to engage in it. If you have the idea for a mobile or web application, feel free to write to us.